Original stock curtains are available in heights of 8', 9', 10' and 12' high and widths of 6', 12' and 24'. Available only in blue bottoms, clear centers and white tops. 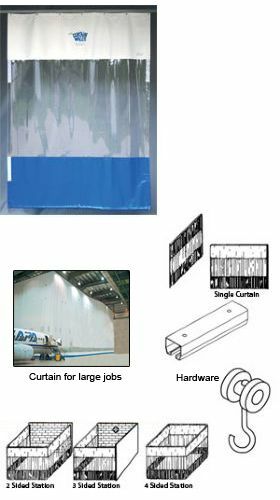 Stock "Curtain Station" packages are also available and are designed to enclose one full 12' wide x 24' deep work stall. The Goff Curtain Wall System can be mounted directly to a ceiling, wall or suspended. For smooth, easy movement, all curtain systems come complete with a heavy duty track (16 gauge) and rollerhook system along with either suspend, wall or flush mount brackets. FOB Shipping Point. Same as stock curtains with hardware packages except black bottom, 14 mil yellow weldview center and a white top. Blocks harmful UV light. Custom sizes and colors available. Call dealer for more information. Product No. Height Wt. (lbs./ft.) Price per Ft.